The first video-assisted thoracic surgery (VATS) anatomic lobectomy for lung cancer was described two decades ago. During this time VATS has become a safe and effective approach for the treatment of lung cancer with a low level of morbidity and mortality. 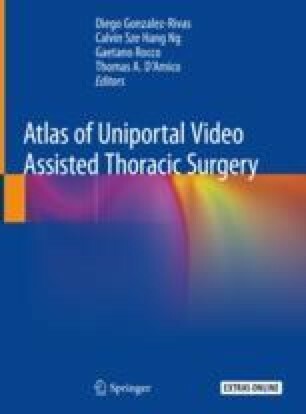 Nowadays, thanks to advances in VATS and the experience gained, most pulmonary resections can be performed by video-assisted thoracoscopy in a safe way. By gaining experience, more complex or advanced cases are approached using the VATS technique. However, as VATS lobectomy is applied to more advanced cases, the conversion rate to open thoracotomy can increase, especially during the learning curve, mostly because of the occurrence of intraoperative complications. The best plan to solve complications during VATS lobectomy is to avoid them. Perform a pulmonary resection as safe as possible by VATS depends on the patient selection, the patient’s characteristics and the anticipated technical aspects of the case as well as a careful pulmonary dissection. Regardless of all the prevention of intraoperative complications, these can occur, so we must develop plans or strategies to minimize them if they occur. The correct assessment of any bleeding is paramount during thoracoscopic major procedures. Major vessel injury may cause massive bleeding in case of an inadequate management of the defect. If bleeding occurs, a sponge stick should be available to apply pressure immediately to control the haemorrhage. Then a decision must be made promptly as to whether thoracotomy is needed or if it can be solved through the VATS approach. This will depend mostly on the surgeon’s experience. What should be clear is that an intraoperative complication should not become an intraoperative catastrophe. The online version of this chapter ( https://doi.org/10.1007/978-981-13-2604-2_33) contains supplementary material, which is available to authorized users.